Well its Monday again and the weekend has flown by in a flash but never fear a new week means more shopping time. Now that spring is in full swing its time to pack away those heavy coats and thick sweaters and move into spring. 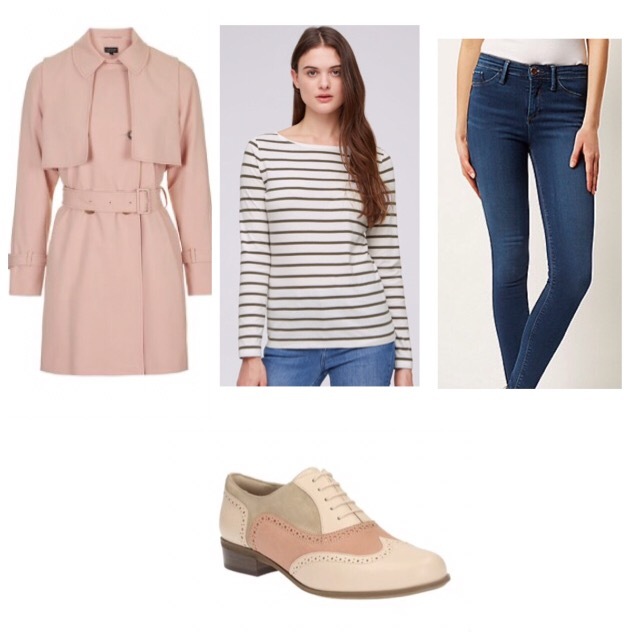 However as we all know spring in the UK is never a time for the pretty linen dresses and light skirts and the weather is never that warm but with some few easy tips you can update your wardrobe to reflect the spring time fun but still keep warm. Step 1 – The Trench. If you don’t buy anything else this spring time this is the one thing that is a must. It is a great staple to have in the wardrobe and easy way to give that smart casual look. This season it is all about colour so you don’t even have to stick to the traditional beige like the classic Burberry. Experiment with blues, greens and even pinks (Left – Topshop £85). Step 2 – The Basics. Never forget your bread and butter staple in your wardrobe. Its always handy to have some good quality jersey basics in white, grey and black as they will always be helpful but why not go for a bit of a nautical theme with a great stripe. Nautical is always on trend every spring season so you can’t go wrong (Middle – Jigsaw £39). Step 3 – Denim. You will always need a pair of jeans in your wardrobe so this is the time to go out and get them. At the beginning of the spring season there will always be a big push on Jeans on the high street so there is no better time to go out and get them. Always bear in mind when trying on jeans that denim stretches so never buy a pair that is too big for you as they will only get bigger. Don’t forget there is a cheat if you don’t want to wear a pair of jeans, a pair of jeggings. Comfort and the illusion of jeans (Right – River Island £40). Step 4 – The accessories. You are never fully dressed without your accessories so don’t forget to always tie in your outfits with some great jewellery pieces from a statement necklace (see previous post) or a classic handbag. The one thing we must say is the best accessory you can have is great shoes to complete an outfit. We swear by the Clarks classic brogue. They go with absolutely everything and they come in a range of great colour. We’ve spotted these great peach colour (Bottom – Clarks £60) but they come in Tan, Black, Pewter to boot. Worth while starting a collection.